How aware are you of the impact that your daily activities have on your body budget? I got an electric car few months ago and last week for the first time experienced what’s called “range anxiety” – wondering whether I would have enough battery power to get to the airport and back comfortably. At any point of the day my car shows me how far I can go in the best possible conditions and the worst ones until I have to recharge. Wouldn’t it be marvelous if our bodies gave us the same kind of information about our own energy reserves and reminded us whenever we needed to replenish them? Except they already do, we are just very skilled at ignoring those signals. And not just that – it seems that we are intent on masking our true physiological state (real state of the checks and balances) so that we don’t notice just how depleted we are. It seems that we are intent on pushing our bodies to the limit with our commitments and general pace of life, using up our resources but not taking enough care to replenish them. When you first woke up this morning, how did you feel? Did you feel refreshed and energized, ready to start your day? Or did you feel drained and kept hitting that snooze button? Every morning when you wake up you get a clear sense of your body’s starting “budgetary state” – whether it is balanced or depleted. Then everything you do or experience in the course of your day serves either as a deposit toward the body budget or as a withdrawal. How aware are you of the impact that your daily activities have on your physiological budget? Let’s conduct a quick experiment. 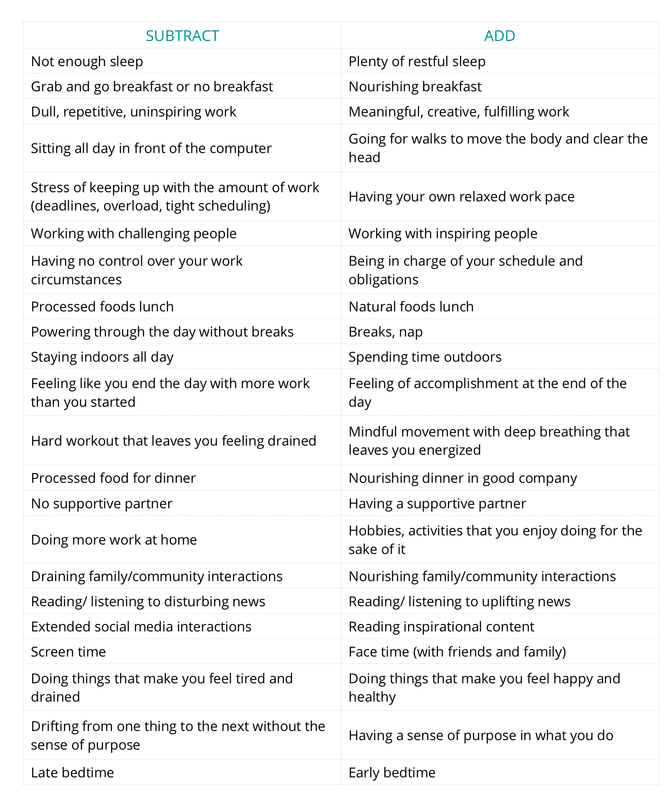 Grab a pen and some paper and read through the list below applying it to your average day. Read two statements in each line and choose the one that applies to you more accurately. If it’s a statement from the SUBTRACT column, put a minus sign on your paper. If it’s from the ADD column, put a plus sign on your paper. After you go through the whole list, compare the number of pluses and minuses and it will give you some idea about how balanced or unbalanced your body budget is. Now compare the number of pluses and minuses – do they balance each other out? These are just some basic things that most of us deal with on a regular basis. But you might also have some chronic budget-draining things going on like financial insecurity, loneliness, being a primary caregiver for a child or an aging parent, chronic pain, and so on. If that’s the case, are those factors being balanced by other, nourishing experiences in your life? 1. It puts stress on your physiology and makes you more vulnerable to disease. 2. Your body’s internal state as perceived by your brain has a direct effect on how you feel day to day. “Your affective feelings of pleasure and displeasure, and calmness and agitation, are simple summaries of your budgetary state.”(1) So if you are felling generally unpleasant and/or agitated, your body budget is unbalanced; if you are feeling generally pleasant and/or calm, your body budget is balanced. This means that your physiological health, your general sense of pleasure/displeasure or calmness/agitation, and your entire perception of the external world (in yoga we sometimes call it “coloring” of the world) entirely depend on the state of your inner physiological balance. In short, your body balance directly affects how you function, feel and think. No wonder yogis developed such extensive techniques primarily focused on balancing the energy and physiology. Our moment-to-moment physiological state literally impacts every aspect of our existence. Over the next few weeks we will explore how we can use yoga to balance your body budget by addressing the three pillars of physiological health: stress, sleep and energy. We will use latest scientific research to support traditional yogic ideas and some of those findings might surprise you. Tune in!